Dybowski Castle was erected on the left bank of the Vistula by Władysław Jagiełło as the seat of the Polish starosts and a strategic military point to the enforcement of the traffic control on the Vistula and the Polish-Teutonic border. Its construction began probably around 1423-1425, but already in the first period it was rebuilt several times. 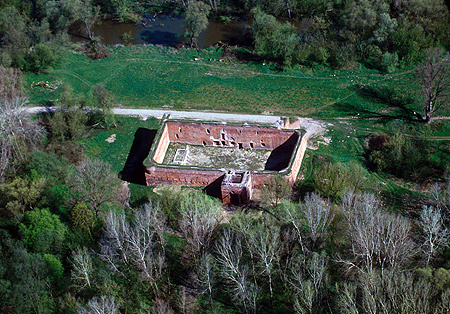 In 1998-2000 complex archaeological works of the Dybowski Castle were conducted by a team under the direction of Lidia Grzeszkiewicz-Kotlewska. The building was cleaned from the overgrowing bushes and superfluous soil layers. Outcrops of foundations made it possible to recognize subsequent phases of the construction and the reconstruction of the castle. It is known that above the remaining walls the castle had yet one, third storey, which is confirmed by the prints from the 17th century. On each of the three storeys there were three rooms, very spacious – of 8 m width and lengths of 9, 18 and 9 m. The cellars were divided similarly. They were plastered and had a wooden floor, and therefore they were probably used as utility rooms, warehouses, and kitchens. The stronghold was not only grand, but also snugly equipped. In the late fifties on one of the walls of the habitable part of it paintings with mostly vegetable ornaments, of which there is unfortunately no trace at present, were found. During excavations fragments of mediaeval glass cups, Gothic furnace tiles with figural representations, and early Renaissance glaze tiles from the turn of the 16th and 17th century, including a fragment with the portrait of the king wearing the crown. Next to Cracow’s, this is the only collection of furnace tiles so beautiful and diverse in Poland. A big amount of pottery ceramics from the tableware - elements of mugs and bowls - were also excavated. In 2000-2002, about 500 m from the castle traces of the original location of Nieszawa - a 15th century town, which rivalled with Toruń in trade on the Vistula. In 1431, it was attacked and ravaged by the inhabitants of Toruń with the support of the Commander of the Teutonic Order. In the end, under their pressure, Kazimierz Jagiellończyk moved Nieszawa to its present location - 35 km from Toruń up the Vistula. In 1431, the Dybowski Castle was taken over by the Teutonic Knights, who began its reconstruction. It was surely then that the courtyard, walls and the tower with a gate came into being, The next extension of the castle took place between 1454-1462, when the fortress came back into Polish hands. Surely then were the walls elevated and the Gate Tower rebuilt. In 1454, Kazimierz Jagiellończyk granted in the Dybowski Castle the famous nobleman's privileges, which formed a base of the gentry’s democracy and of the Polish parliamentarism. The Dybowski Castle suffered considerable destruction during the Swedish incursion in the 17th century. A redoubt, the firing of which from Toruń caused the demolition of the habitable part of the Castle, was situated close to it, in consequence of what part of the ceilings of upper storeys sank to the cellars. In spite of this, in 1813 the Castle became a place of efficient defence for Toruń during the siege of the city by Russian and Prussian armies. In 1848, it was incorporated into the precincts of the extending Fortress of Toruń and encircled with a collar embankment. Until the beginnings of the 20th century, it was only partly used. Today, its ruins are an attractive tourist point on the bicycle trail to Włocławek. Each year, in September, an archaeological picnic takes place in Dybowski Castle.